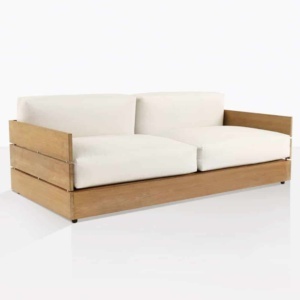 Bring the slick lines of the lofts, studios and galleries of New York City to your home with the chichi Soho Grande Teak Outdoor Furniture Collection. Built for use inside and out, this outdoor furniture collection augments, conceptualizes and presents in-vogue living with its effortless, modern design. The Soho Grande suite features large planks of beautiful Grade-A Teak tightly placed next to each other; with the addition of matte, stainless steel bolts for a crate like effect that oozes elegance and style, complete with gorgeous Quick Dry foam and Sunbrella® cushions. Contrasting exquisitely against the sleek, hard lines of the wood are the most cushy, commodious Sunbrella® cushions we’ve ever had at Design Warehouse! Plump and fluffy; you will want to dive into these beautiful pieces and stay for hours. The Soho Grande Collection is made up of the Soho Grande 3-seater Sofa, 2-seater Loveseat, Club Chair, Round Coffee Table and Rectangular Coffee Table. Create a glamorous entertaining area in your outdoor space with 2 Soho Sofas opposite each other with the luxe Soho Grande Round Coffee Table nestled in between for a minimalist and modern atmosphere. Under the veranda outside with a Soho Rectangular Coffee Table surrounded with the cushy Soho Grande Club Chairs for hours of wining, dining and reclining! 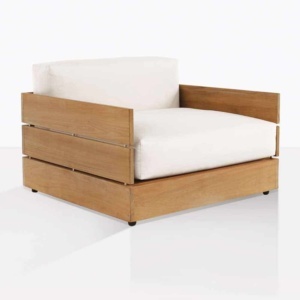 The Soho Grande Teak Outdoor Furniture Collection is constructed using only the finest Grade-A Teak wood, with 316 Stainless Steel bolts and marine grade glue; complemented with Sunbrella® Cushions in your choice of Taupe or Canvas. 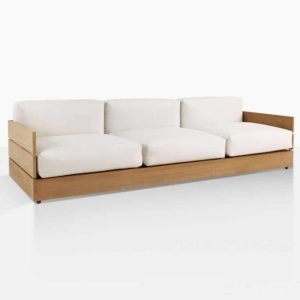 Sunbrella® cushions are FREE with your purchase of Soho Grande Deep Seating! Cushions are available in Canvas and Taupe. Colour Shown is Canvas.